VICTORIA, B.C. 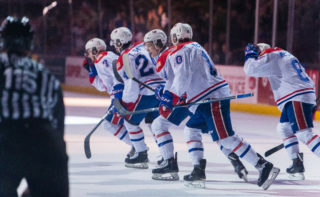 – The Victoria Royals broke a 3-3 tie in the third period with a four-goal outburst on their way to a 7-3 victory over the Spokane Chiefs on Tuesday night in Victoria, B.C. 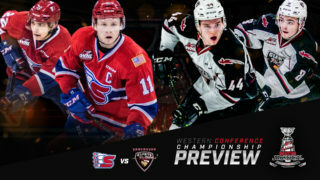 The loss snapped the Chiefs’ season-high five-game winning streak and left Spokane six points back of second place in the U.S. Division. Victoria scored on their first shot of the game just 3:14 into the contest to take a 1-0 lead. The Royals would extend the lead as they scored on their first power play attempt at 6:54 to take a 2-0 advantage after the first. Spokane outshot Victoria 10-5 in the first period but went 0-for-2 on the power play while the Royals were 1-for-2. 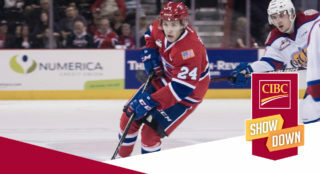 The Chiefs cut the deficit in half midway through the second period when Hudson Elynuik scored his fourth goal in two games and 28th of the season, from Luke Toporowski at 11:48 to make it 2-1 Victoria. 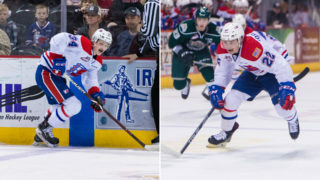 The Royals went back up by two on Noah Gregor’s goal while skating 4-on-4 late in the second to go up 3-1, but Spokane answered back with Jaret Anderson-Dolan’s team-leading 36th of the season from Kailer Yamamoto with just 20 seconds left in the period to cut the deficit to 3-2 after 40 minutes. Yamamoto would pull the Chiefs even with his 20th goal of the year from Anderson-Dolan and Ethan McIndoe 4:22 into the third period to make it 3-3. From then on, the Royals took over responding just 24 seconds later on a shot from the blue line to take the lead for good at 4-3. Victoria put up three goals over the final half of the third, including one empty-netter, to pull away to the 7-3 win. Victoria has now won 2-of-3 from Spokane this season with the fourth and final match-up scheduled for tomorrow night. The Chiefs outshot the Royals 31-23 in the game but went 0-for-4 on the power play, while Victoria was 2-for-5. 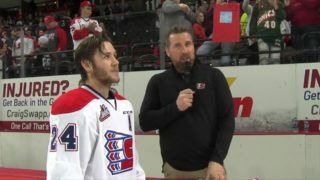 The loss also snapped an eight-game road winning streak for Spokane. 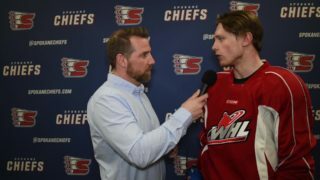 The Chiefs and the Royals will close out their regular season series with the rematch in Victoria on Wednesday night at 7:05 p.m. Mike Boyle will have the radio call on 1510 KGA NW Sports Talk starting with the pre-game show at 6:30 p.m.